View from the Birdhouse: I found great 45 RPM records! How should I list them on eBay? I found great 45 RPM records! How should I list them on eBay? I recently found a wonderful retro teeny-bopper style record box full of 1960's to early 1970's 45 RPM records -- from the Beatles to Bobby Sherman, with lots of picture sleeves. They are in great condition! The only problem? I've never listed records and didn't know where to start. I called on my friend Bob, who has a record store at http://stores.ebay.com/Gillilands-Memorabilia?refid=store. He was very helpful with answering my questions, and also said I could post them here. Question: What photos should I take to list 45 RPM records? Answer: For a picture sleeve I photograph the front and back of the sleeve and the A side of the single. If the single is a rare variant or another type of special release such as a radio station copy or a promo copy, I'll also photograph the B side. For records in regular sleeves I'll photograph the sleeve and the A side. Question: What should I include in the 45 record descriptions? - Notable songwriter, producer or guest musician if you know that info. - If the label is listed as a Radio Station or DJ copy or if it is a Promo Copy. - Condition of vinyl. List scratches, scuffing and any writing or damage to the label. - Condition of the sleeve. Note corner wear or writing on the sleeve; if the record has no sleeve you should note that the record is being shipped in a replacement sleeve or no sleeve. - For longish 1960's and 70's songs that were released on 45, the labels often released a long version and a short version. On some of the more noted releases of this type (Iron Butterfly's "In-A-Gada-Di-Vida", Don McLean's "American Pie" and The Doors' "Light My Fire"), look to see if the title is listed as the abridged or album version. - Mid-60's to mid-70's Soul and R&B that is not on the Motown, Stax or Atlantic labels are known to collectors as "Northern Soul". Use the words Northern Soul in your subject as it is still a very hot area for collectors. One thing I forgot to add. For the things to list in the description I also add the release or catalog number. 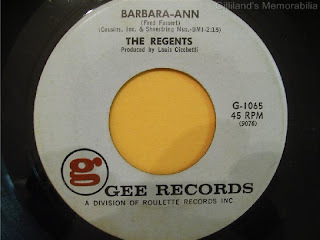 This is easy to find and I'm including an example (see picture of "Barbara Ann" 45 record). If you look to the right side of the label there is a number "G-1065". This is the release or catalog number for this single. The numbering scheme is different for each label. BTW, the single in this photo is the original release of that song, the one that The Beach Boys later made famous. The copy I have is the more scarce original release, which was only a minor regional hit in New Jersey. After The Beach Boys made it a hit the label re-released the song and it sold MANY more copies. Question: How do I describe record condition? I don't have a turntable hooked up, so need to depend on a visual inspection. Answer: You are looking for scratches, scuffing and warping. 45's, and really most 1950's and 60's LP albums, are far more resilient and less likely to be damaged by normal scratching and scuffing when compared to later releases of the 70's and 80's. I've found that many collectors actually enjoy the light surface noise on 45's as many of them say it adds a little bit to the "atmosphere" and "vintage feel" of playing them. While it is not a good idea to assume all buyers will feel this way, I can say they are far more accepting of light noise than LP buyers. Scratches that look like the faint scratching you often see on clear plastic, or scratching in a sort of "whirling" pattern and tiny in appearance, are called "surface scratches" and they usually do not effect the quality of sound when being played. Deep scratches can and usually do cause a problem. The rule of thumb is that if you can feel the scratch with the tip of your fingernail, it's a deep scratch and anything else is surface scratching. Scuffing is visually noticeable if the vinyl takes on a grayish appearance. Sometimes you'll see the whole surface scuffed and sometimes only sections will show scuffing. Answer: In my experience, most 45 buyers are happy collectors in the truest sense. Most are completists in the area they collect and each 45 they buy makes their collection a little closer to being "complete". I have one buyer who collects versions of the song "Sunny" and his collection has over 400 recorded versions of the song. Most 45 buyers are like this; they either collect everything released by a particular artist, versions of a particular song, a particular musical genre, a particular record label or a particular period of time. My experience is that 45 collectors are fun, quirky and happily obsessed with whatever they are buying. They are friendly and as long as you try to accurately describe the condition of the 45 and pack it very well and safely for shipping, they will be thrilled to shop with you. Sally, thanks for your nice note. I really enjoyed learning about selling 45's ... a whole new field for me! Bob really knows his records!